Guest post by Mary Chris Escobar, author of How to be Alive. I had a huge ah-ha moment recently. I could call it a head-desk, moment, but I like the more positive sound of ah-ha (and try to avoid intentionally banging my head into things). In July I attended the Romance Writers of America (RWA) conference and had a chance to connect with a representative from a popular online retailer. He agreed to take a look at how I was marketing my books and make some suggestions. His top suggestion (paraphrased): Your most recent book looks great, give the other two a similar look so they present consistently. Before and after: Consistent design identifies a book by Mary Chris Escobar at first glance. You know how some messages take a while to sink in? How sometimes there is this resistance phase before you can acknowledge, that yes, actually that is a solid idea and I should probably consider it? There was none of that with his suggestion. Instead it was an immediate acknowledgement along the lines of what an amazing idea, followed quickly by it seems so simple, why didn’t I think of that? • I don’t write books in a series. I understand that a series should look the same, but I figured individual books were exactly that: individuals. No need for them to match. • I overlooked the concept of author as brand. No, my books aren’t all linked in a series, but they do all share one very basic thing in common — me. 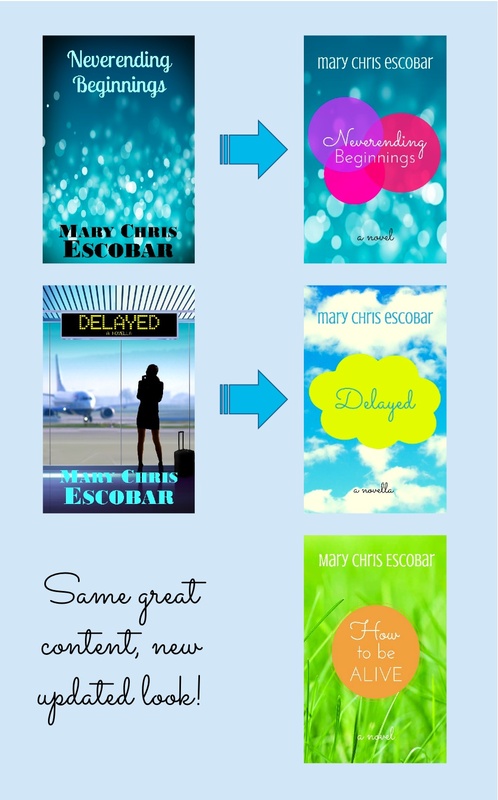 Readers should know at a glance that this is a Mary Chris Escobar book. I liked my original covers, I really, really did (especially the one for Delayed, with the title in the digital sign), but the moment I uploaded the new covers and saw them next to each other in an online store, I knew I had done the right thing. Now readers can easily identify that my books are all related and I couldn’t be more proud of how my little family of books is dressed. *On a side note, connections like the one I made at RWA are one of the many reasons why conferences are so important. If you are in Virginia (or even it you aren’t) I would highly recommend James River Writer’s annual conference. It’s right around the corner on October 18- 19. Click here for details. Mary Chris writes women’s fiction. Her second novel, How to be Alive, came out in late June. She lives in Richmond, Virginia in a renovated parking garage with her husband, and you can find her just about anywhere with good coffee or craft beer and at marychrisescobar.com. She also hangs out on Twitter @marychris_e. Her novella, Delayed, is free at all major online bookstores — try it out today! Thank you, Mary Chris, for sharing your revelations on author branding and design consistency.